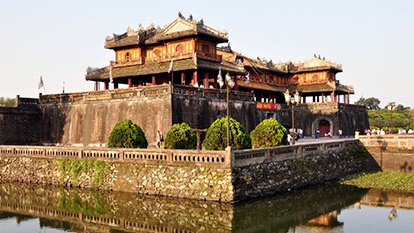 Hue is located in Thua Thien prefecture and is in the central part of Vietnam. Located 660 km from Ha Noi and 1080 km from Saigon, Hue has always been considered the fulcrum of Vietnam's two rice baskets, the Red river delta and the Mekong delta. Hue became the name of Vietnam's most well known ancient capital because of the local mispronunciation of the word Hoá in Thuân Hoá.